Genuine OEM Lexmark Toner Cartridge, Yellow, Extra High Capacity 16,500 page yield. 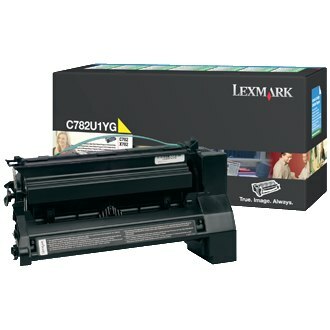 Lexmark part number: C782U1YG, C782U2YG. Color Laser Toner Cartridge compatible with Lexmark C782dn XL, X782e XL. Genuine OEM Lexmark Toner Cartridge, Cyan, Extra High Capacity 16,500 page yield. Lexmark part number: C782U1CG, C782U2CG. Color Laser Toner Cartridge compatible with Lexmark C782dn XL, X782e XL. Genuine OEM Lexmark Toner Cartridge, Magenta, Extra High Capacity 16,500 page yield. Lexmark part number: C782U1MG, C782U2MG. Color Laser Toner Cartridge compatible with Lexmark C782dn XL, X782e XL. Genuine OEM Lexmark Toner Cartridge, Black, Extra High Capacity 16,500 page yield. Lexmark part number: C782U1KG, C782U2KG. Laser Toner Cartridge compatible with Lexmark C782dn XL, X782e XL.